It is no secret that Bookmans has mad love for planet earth. Recycling is in our blood and our business model. Every April we celebrate this big blue marble with events that highlight the environment. Join us for educational workshops on climate change and kids activities where you can bring out your inner Lorax and speak for the trees. From the picturesque Sonoran Desert to the tall pines of Northern Arizona, our Bookmans locations have earth-friendly events to help you show some love to Mother Earth. Take a peek at our events calendar to see what we mean. Our new Midtown location is kicking things off this April with an Earth Day Lorax Celebration. Find a new addition to your pack at our Raptor Rescue Animal Adoption Event. Don’t miss out on the return of fan favorites like Toddler Tales and Pokemon Meet-up. Bookmans East has not one but TWO opportunities to get your color on at our Adult Color Club! Don’t miss out on a special Easter Story Time and Music Hour. Want to learn more about how you can live sustainably? Stop by The Bookmans East Earth Fair for a meet and greet with local and global organizations working hard on preserving our most important resource, EARTH! Our Northwest store kicks off Earth Month with a Flower Planting Craftapalooza. Think your egg hunting game is top notch? Stop by the Easter Egg Hunt on April 15th. Can’t make it for flower planting? Fret not my friends, Bookmans Northwest is hosting two Craftapaloozas in April, including a special Earth Day event! Bookmans Phoenix invites you to an evening with the stars at their Free Telescope Workshop with Phoenix Astromnomical Society. Celebrate Earth Day and Arbor Day with Bookmans at the Environmental Education Center at Veterans Oasis Park. Finally, there is nothing like growing with books at Story Garden! Don’t miss out on Bookmans Mesa’s Easter Egg Egg-stravaganza at Saturday Morning Story Time. It’s going to be egg-celent. Bookmans Mesa will also launch a new event this April, Toddler Time, a book club for little ones. Bookmans Flagstaff will host conversations about conservation at Climate Change Awareness Day! Stop by for an original music performance by Lora and Monte., and Flagstaff fave Ed Kabotie returns for a live musical performance of his original tracks! 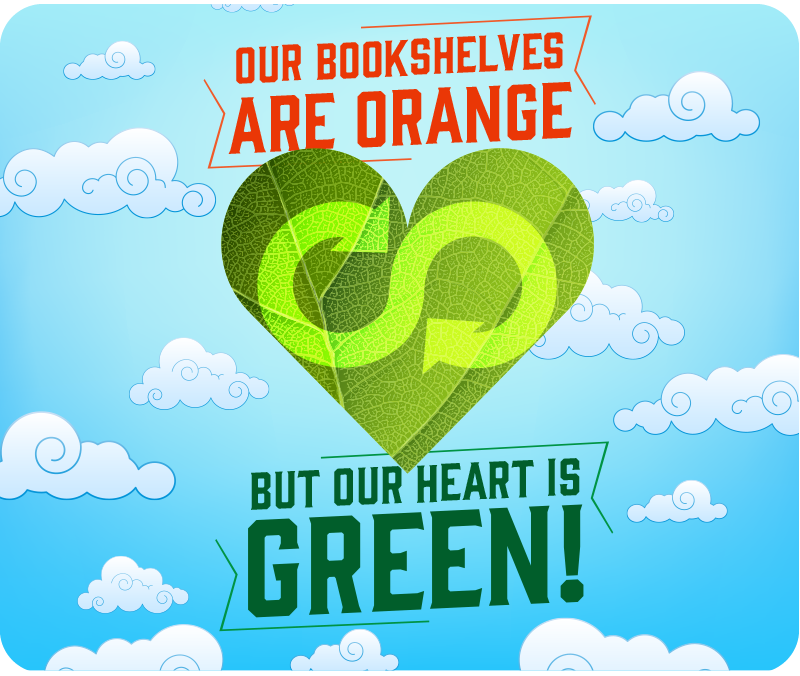 Here at Bookmans we like to think that even though our shelves are orange, our hearts are most definitely green. Celebrate with us at one of our many earth-friendly events. Bookmans is good for your pocket. Good for the planet!